The arms are those of Voronzov accolé with those of Branicki for Prince Michael Semenovitch Voronzov (1782-1856) and his wife Elizabeth, daughter of Count Francois-Xavier Petrovitch Branicki (1731-1819) by his wife Alexandra Vassilievna Engelhardt (1754-1838). This verrière is significant because of its association with one of the most famous early 19th century French silver services. Ordered by the mother of Elizabeth Branicki, the Countess Branicki, the magnificent service comprised 140 pieces, many double-gilt. 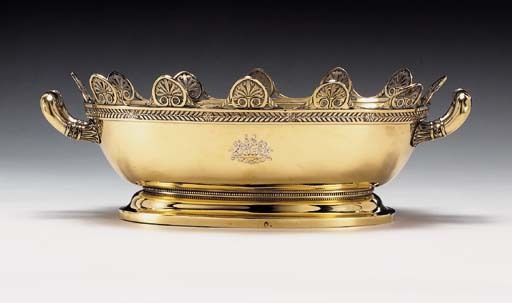 Both the Branicki service, and this verriere were manufactured by the leading Empire silversmith J B C Odiot, and appear to have been ordered the same year. The bill for the Branicki service, dating to May 13, 1819 still survives in the Odiot archives; the marriage between Elizabeth Branicki and Michael Voronzov, when their arms were united, took place just one month earlier, on April 20, 1819. Through military prowess, political positions and familial connections, the couple became amongst the wealthiest and most powerful figures in 19th century imperial Russia. Their extravagance was legendary, particularly related to the construction of Aloupkha, their gothic palace rising above the Black Sea. Michael Voronzov (1782-1856) was born in St. Petersburg but raised in England, where his father had served as Catherine the Great's Ambassador to London, and where the young Michael associated with the beau monde of the Prince Regent's circle, developing Anglophile tastes he would carry throughout his lifetime. As a young man he distinguished himself as an officer, attaining glory in the Napoleonic campaigns, serving as Commanding Officer of the Russian troops during the occupation of Paris in 1815. Voronzov proved to be equally adept as an administrator. In 1823, he was appointed member of the Council of Empire and Governor General of New Russia and Bessarabia. Under his autocratic rule, he brought commerce and infrastructure to the region, his nephew writing, albeit in a biased manner: "that throughout the whole of South Russia you could talk to no man for half an hour without hearing his name, and never without a blessing." His marriage to the fascinating Elizabeth Branicki (d. 1889) was no less calculated. Her mother Alexandra was a favorite of Catherine the Great, and the favored niece and mistress to Prince Potemkin. It was to Alexandra that Potemkin bequeathed everything at his death and Potemkin may well have been the father of Elizabeth. Elizabeth herself was considered one of the most seductive women of her day. Alexander Pushkin was one of her lovers, and she was said to inspire his heroine Tatiana in Eugene Onegin (see Lesley Blanch, The Sabres of Paradise, 1960). It is unclear if other pieces bearing the arms of Voronvoz and Branicki were manufactured. The Branicki service itself appears to have remained within the Branicki family until it was transferred to state ownership in the 1920s and promptly sold. Many pieces are now in the Rijksmuseum. A magnificent pair of tureens from the service were sold from the Collection of Audrey Love at Christie's, New York, April 28, 1992, lot 31.